Yeah, one of the best albums ever! The quality of this release is just above and beyond any standards. The outstanding success of this release lies in the way how all the essence of their work as a whole has been concentrated and brought forward to the masses in such supreme brilliancy. Surely, putting their point across. Unmissable! 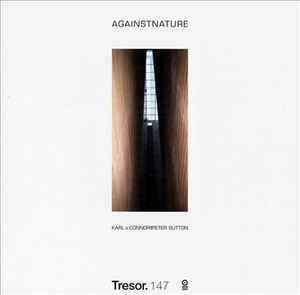 What it all comes down to is that "Against Nature (11 Reclaimed Fragments)" is a re-release of "Againstnature" released on Tresor Records in 2000, catalog#: Tresor 147. Apparently, the original producers Karl O’Connor and Peter Sutton were not pleased with the way the album was tweaked and adjusted by the label prior to release a decade ago, and so they have re-edited and sequenced this tenth anniversary reissue, dubbed 11 Reclaimed Fragments, on the good old Downwards imprint, providing us with their original vision to the letter, hopefully for the better. Well, while I'm not questioning the former, it's the latter which arouses curious remarks, as the only difference between the original pressing and this one, apart from the obvious new artwork and vinyls appearing in clear smoked color, is the D side of the Downwards version. Since the insert sheet and the non-existent center labels don't provide any information, here is the breakdown. A1, A2 and A3 are the exact same tracks which appear on the A side of "Againstnature"; Washing My Hands, Let Them Bleed and Paralyzing, respectively. The B side contains two tracks, just like the Tresor release, and those are, in order of appearance, Nothing And No One and Meat. Guiltless, with its eerie orchestral interlude, which performs an accompaniment to this spectacular classic, and Under Skin, are two tracks on side C, identical to the original version as well. D1 is a short experimental beatless piece which goes on for a little under sixty seconds, and fits in quite well, going hand in hand with A1 or C2. Short, industrial, almost like an abstract field recording, with glimpses of the eighties post punk scene. D2 is actually the track No Sense / No Reason, the A1 tune on Female's sophmore album, "Angel Plague". I need to emphasize though, how the tune here is not the album version, but the Regis re-work, found on DN 002, also track A1. D3 is the track Looking Through The Eyes Of Love, also taken from the album "Angel Plague" [DNLP07], positioned as D1 on that release. The version presented here does not in any way differ from the cut on Female's album. D4 is a ninety second, harsh and eldritch ambient contribution which will make your hair turn grey with all its darkness and force. The album ends in the same manner it started in. There are a few minor bugs though. First of all, I know it all comes down to taste, but the decision not to include Hanoi Hanoi, leaving its place to the Female tracks is a mistake in my opinion. That track was a particularly massive and effective techno work out, with that vocal snippet which kept heads nodding and bodies turning for as long as you could keep spinnin'. But that is only a minor complaint though, becuase if the original album was intended to sound like this, then any further criticism is superflous... Track arrangement issues left aside, the vinyl looks awesome, really. However the choice not to provide any information whatsoever about the music on their surface makes it painfully difficult to see where one track begins and the other ends. The sides are etched in the run-out grooves, but they are written in such small font, that unless I don't place the vinyl right under the flash bulb, there is no way I can read what side am I about to put on. But then, it all adds to the mystery. No track names, durations, no inormation, just four sides with some begrimed alien fetus residing in the middle. Put it on. Play it loud. Cherish it for as long as you live. One thing I am particularly fond of is the fact some of their best productions ever have finally made it home, if you follow. Guiltless, and a couple of other tracks off this release belong on Downwards, and it's about time they are brought where they were supposed to be in the first place. Bottom line is: Female and Regis enthusiasts need this, actually few of them are without it, while those of you who missed it the first time around finally have a chance now to fetch and revere some of their best compositions. Get it while it's still in stock, because albums as good as this one tend to disappear in no time. Oh yeah, before I forget, the whole thing plays at 33rpm. Absolutelly brilliant release from the remorseless duo Karl O' Connor and Peter Sutton. Not much can be said here and make it seem like justice is being done to the music. If you're a fan of the whole Downwards mono sound - then this is a stop you'd want to get off at. One of the best outputs in that niche I have ever heard, with hypnotizing, rough and rugged techno forcing you into submission as crunchy tidal waves unload themselves out of your speakers head and shoulders above you! Stays neatly withing the boundries of the techno genre, but that's the whole point. This is how I love my techno to sound; fat, loud, crispy and percussive. All tracks are marvellous, but Let Them Bleed, the quintisential classic Guiltless and the closing number, Session One, with amazing development and a superb melody kicking in halfway through the track, all deserve a special mention. At certain points during the album, some tracks are separated by short intermissions consisting of short outbursts of static, eery and sharp classic instruments and darkish tones crawling in the background. It only helps create an overall "grey" atmosphere of the album. My only problem is that it's only 53 minutes long, as I could go on listening to techno music this good over two fully loaded compact discs straight. A clean and well deserved 5/5. This is a very essential release for the Birmingham lovers, Karl O'Connor aka Regis and Peter Sutton aka Female team up to deliver a stompin' album. A very strong one with killer tracks like 'Meat' and the famous 'Guiltless'. The album has a light mixed edge because all tracks flow into each other. The short tracks (1, 3, 7) are a kind of industrial ambient with dark and mysterious sounds. Track 10 is an extra track according to the CD inlay, it was part of a Live PA of the 'Hostage' project (also a project between Karl and Peter). Sound quality is perfect, ambient and stompin' kicks are just wonderfull on this album. Quality mastering. Easily 5 out of 5.
this is the best record of true birmingham sound released in the last years, all tracks are powerful but distinguished. Simply techno, whithout adornments and serious dark sounds...like those old vinyls from Downwards but in a really fresh new wave of ideas.